Taipei, March 21 (CNA) Taiwan will donate coast guard patrol vessels to Palau and Nauru, two of its diplomatic allies, the Ministry of Foreign Affairs (MOFA) confirmed Thursday before President Tsai Ing-wen (蔡英文) departed on a visit to the Pacific island nations. During Tsai's one-week visit to the South Pacific, Taiwan will sign a coast guard cooperation agreement with Palau and Nauru, similar to a deal it already has with the Marshall Islands, MOFA spokesman Andrew Lee (李憲章) told reporters. Meanwhile, Tsai will present each of the two allies with a miniature model of the boats to symbolize the donations, during her visit there, he said. 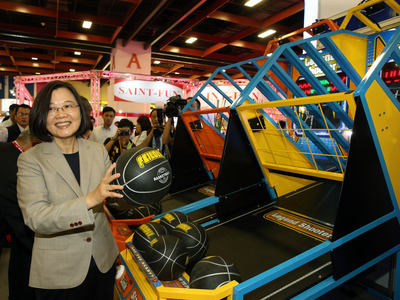 He was responding to reporters' questions about a Radio New Zealand report earlier in the week that said Taiwan would donate a patrol boat to Palau during Tsai's visit there March 21-23. Tsai, who is on her sixth trip abroad as president, is scheduled to visit three of Taiwan's diplomatic allies, Palau, Nauru and the Marshall Islands, May 21-28.